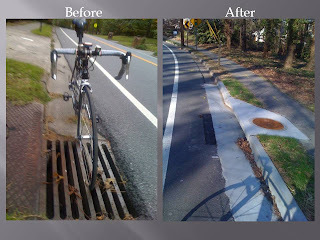 CyclingJoe: Fixed Drain Grates - is Sandy Springs working towards Bike Friendly? Fixed Drain Grates - is Sandy Springs working towards Bike Friendly? Honey or vinegar? What attracts more flies? Which approach works best to get things done? Sometimes its a combination of both. In 2008, as a (then) resident of the City of Sandy Springs, GA I reported several "Wrong-Way Drain Grates" to the Public Works Department. A couple of days later a puzzled contractor met me at one of the locations and I explained to him the issue: Drain grates running parallel to the direction of traffic is a serious safety concern for bicyclists. The wheels can easily get caught in them and the bicyclist could have serious injuries. The contractor took a can of spray paint and sprayed around the grate. Over the next 3+ years occasionally I would check back in with the city to see if they were going to do anything about them, but never received a reply that they would take action. Until now. I was out for a ride yesterday enjoying the beautiful spring weather and what did I see to my happy surprise? They have begun to fix the drain grates!! The photo above was taken on Spalding Drive, just south of Darlymple here. Now how did this come to pass? #1: I became self-educated in what are bicycle-friendly accommodations. One of my first stops for me in surfing the web was to checkout the Atlanta Bicycle Coalition's site. On it, they had a place that you could report "Wrong Way Drain Gates" in Atlanta. Had I not stumbled across this posting, I'd never have known that this was a serious issue that can be corrected by following standard best practices recognized by transportation planners across the United States. In 2009, I presented to Sandy Springs a proposed Bicycle and Pedestrian Friendly Vision. In early 2010, in response to hearing Mayor Eva Galambos reportedly stating,"Nobody Rides Bikes in Sandy Springs", I created an on-line petition and in about five days had over 300 signatures countering Galambos' assumption, and presented this to their Mayor and Council. I wish Sandy Springs could just do a "File -- Save As" and take their neighbor to the north - Roswell and copy their policies, programs and planning efforts for bicycling. Things like their Complete Streets policy. I wish they'd adopt an Action Plan to Become a Bicycle Friendly City, and start working towards it as we have done in my neighboring town of Dunwoody. If Sandy Springs wants to become a Bicycle Friendly Community, and treat bicyclists as equals with motor vehicles as published by the Secretary of the U.S. Department of Transportation, Ray LaHood (R) I urge their elected officials and staff to start taking a closer look at what the League of American Bicyclists has to say, and then look at regional cities Chattanooga, Chapel Hill, Cary, Charlotte, or even their next door neighbor, Roswell. They all have been formally recognized as a BFC. It's never too late to begin. Heck, any city I've been to in Europe that offers bicycle accommodation (and let me tell you -- there's a TON of European cities that I'd never get caught riding my bike in) has had to deal with retrofitting on layers from HUNDREDS OF YEARS of development. From the Romans, through Medieval times when they built walled cities, to Napoleon, when he tore down many of those walls, to two World Wars of devastation. It just takes some political will, public outreach and understanding that roads are not exclusively for motor vehicle use. The monies that pay for today's roads and bridges are NOT solely paid for out of motor vehicle fuel taxes and tolls. In fact, only just over 50% of the funds to do these projects -- and keep us automobile centric -- are derived from motor vehicle fuel taxes. Revenue comes from numerous sources, including sales & property taxes and other imposed fees. So now you know how to respond to those naysayers when they tell you that bicyclists aren't paying for the roads they use. Just about every bicyclist I know owns and operates a car, too. We're educated, professional and respectable citizens, pleading from the grassroots to be listened to. So what can YOU do to help Sandy Springs become bicycle friendly? It's simple enough to sign up on their Bike Sandy Springs Yahoo and Facebook groups. But what it really takes is only 3-4 dedicated individuals willing to give a few hours a month and LEAD. Interested? Let me know and I'd be more than happy to guide you through the process and reinvigorate bicycle advocacy in Sandy Springs. I've rambled on long enough. Now it's time to get out an enjoy this fantastic spring day!